Michael Booth had previously won the ISA in 2016 and after a poor performance last year due to illness, was determined to come back stronger than ever this year with the goal of winning and racing his best and winning back the championship title. The race presented competitors with some challenging conditions; pouring rain and low visibility in the warm up setting the mood for the race. Michael insisted the weather was not to distract his plan and kept his eyes on the prize and his focus on the race ahead. “The race started and all my focus was on the 18km ahead. Conor Baxter and I were together for the first lap with a chase pack of about nine paddlers just behind us, we quickly broke away from the pack and it was then a two man race”. On the second lap Booth took off in the downwind section gaining a 40 second lead and didn’t look back. “Once I broke away, I knew I had to stay in the lead and hold on to my composure which is always hard when in front”. Booth held his composure in the last lap into the headwind and powered to the finish. He won back his title ahead of last years winner Bruno Hasulyo of Hungary and Vinnicius Martins of Brazil. “Moments like this don’t come around too often, so when do they it really is a special feeling,” he said. Michael had his dad in China supporting him, making the win even more special. “After a tough year with dad not being well and not able to follow too many of my races this season, it was so special to take out the win with him over here by my side – it was the icing on the cake”. 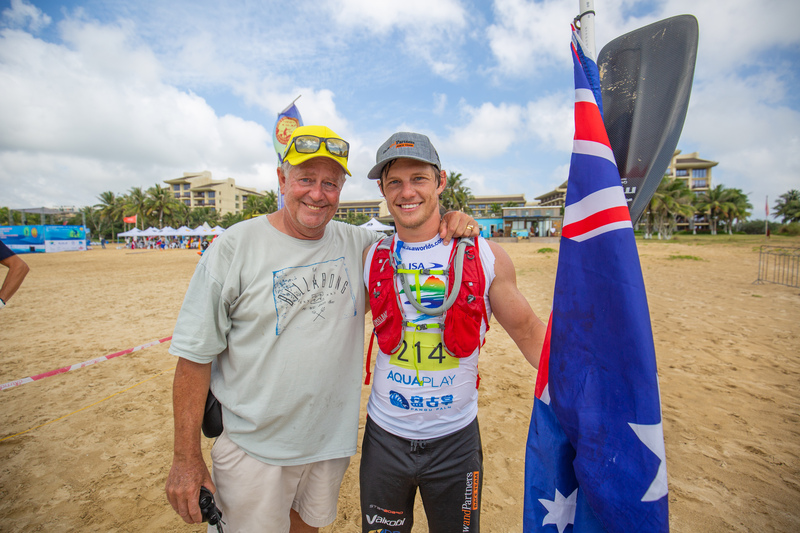 Booth’s win added to the overall Australian team winning the ISA Championships for 2018. “The whole team raced so well over in China and without everyone coming together, stepping up and racing the way we all did, the results we were granted wouldn’t have been possible.